The October issue of NARC. magazine is out now! 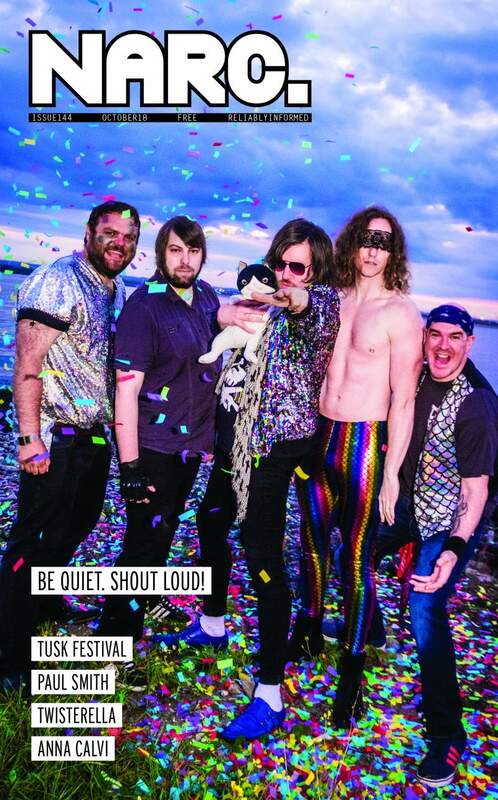 This month’s cover stars are Middlesbrough’s inimitable disco rock mentalists Be Quiet. Shout Loud!, who talk to Claire Dupree about sequins, synths and serious subjects ahead of the release of their new EP. Suitably sparkly images come courtesy of Nick Wesson. You can also find out about some cracking gigs and events coming up throughout the region in October, including Roddy Woomble at The Cluny 2; Hartlepool Folk Festival; Shields EP launch at Star & Shadow Cinema; BCUC at Cobalt Studios; Middlesbrough Jazz Weekend; Heel Turn EP launch at Westgarth Social Club; Grace Petrie at The Cumberland Arms; Ghost Guilt EP launch at Little Buildings; Kiran Leonard at Georgian Theatre; Twist Helix album launch at The Cluny/The Green Room; Her’s at Think Tank? ; Ancient Shapes at Head of Steam; Cocaine Piss at The Cluny and much more. The Culture section features profiles on Durham Book Festival, Middlesbrough Art Weekender and Dan Holdsworth at NGCA, plus previews of Buddy Wakefield at Cobalt Studios; Go Away Johnny at ARC & Dance City; new exhibitions at MIMA; Nathan & Ida’s Hot Dog Stand at Gosforth Civic Theatre; Exploding Collage at Hatton Gallery; Matt Abbott – Two Little Ducks at Middlesbrough Little Theatre; FANS at Live Theatre; Sunderland Stages; Newcastle Alternative festival at The Stand; The Lovely Bones at Northern Stage; Theatre Hullabaloo comedy shows; O No! at Northern Stage; The Important Man at Alphabetti Theatre; Jaisen Yates at Abject Gallery; reviews of Tim Dalling’s Aye Coyote! at Star & Shadow Cinema, Two Pints at Live Theatre and The Fulstow Boys at ARC among others. Interview-wise, Ben Lowes-Smith talks to Maximo Park frontman Paul Smith about taking inspiration from his formative years on his new solo record; in anticipation of her imminent gig at The Boiler Shop, Em Burfitt caught up with Anna Calvi to talk about the reception to her newly released album, Hunter; Linsey Teggert talks to Black Peaks’ Joe Gosney about their intense second album; Laura Doyle talks to Cardiff’s Boy Azooga ahead of two performances in the region this month; Ben Lowes-Smith chats to maverick songwriter BC Camplight about the remarkable circumstances around his latest release; and Mark Corcoran-Lettice asks Chlorine – AKA Graeme Hopper – about his vivid sound collages. Plus, Live Theatre’s Joe Douglas tells us about his favourite songs in Mixtape. In the Review section, we feature demos by Paul Carney, Cactusman, Bloomsfield, Break The Silence and Amongst Heroes, albums from Fucked Up, Julia Holter, Kurt Vile, Matthew Dear, Nathan Bowles and more, plus we review singles by Set Your Sights, Ten Eighty Trees, FEVA and Cherry & Peesh among others. There’s live reports from Alexander Tucker, Jonathan Wilson, Wolfgang Flur, Escape-ism, The Wooden Shjips and many more.